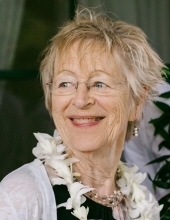 Gloria Fae Bedker, 82, of Great Falls passed away on March 28, 2019. Gloria was born on April 19, 1936 to Fae and George Emerick in Milford, Iowa. She spent her childhood in Milford with her sister Mary Jo and brother Wayne. Gloria loved roller skating at Arnold’s Park and going to the beach of Lake Okoboji. In April of 1956 she traveled to Greeley, Colorado to help care for her newborn nephew, David McQueen. Mary Jo and her husband Bob McQueen introduced their good friend, Donald Bedker to Gloria. They married on December 27, 1956, in Milford. Their daughter Cindy was born July 11, 1958. Six weeks later they packed up their 1955 Chevy Bel Air Hardtop and moved to Great Falls, as Don accepted an Industrial Arts position at East Junior High. Their daughter Lorilee was born May 31, 1963. In 1965, they became CMR Rustler fans when Donald became a guidance counselor and head track coach at the newly opened high school. Gloria emulated Proverbs 31:27, “She watches over the affairs of her household and does not eat the bread of idleness.” For those who know and love Gloria, you know she was not idle. Gloria was a 4-H leader, a Great Falls Public School Supporter, a Belt School Concessionaire, and a member of Sunrise Presbyterian for 50 years, serving as both a deacon and an elder. In conjunction with the Great Falls Parks and Recreation Dept., Gloria headed up the development of 18 acres of Russell Park, and has been the vice president of Neighborhood Council 5 for many years. Family and friends were Gloria’s passion and delight. She loved to host and entertain, and frequently held holiday parties at their home. Camping and traveling brought her great joy. Gloria and Donald visited 46 of our 50 United States. Gloria was an amazing supporter of her family, and is survived by her sister, Mary Jo McQueen (Robert), her brother Wayne Emerick (Anne), her beloved nieces and nephews, her daughters and sons-in-law; Cindy and Greg Bumgarner, and Lorilee and Chris Campbell, her grandchildren; Skye and Zachary Bumgarner, Amy and Sam Leritz, Angela and Murphy Campbell, Molly Campbell, Madison and Christian Alviar; and her great grandchildren; Claire, Carson, Madelyn and Jackson Leritz, and all of her loving friends. Gloria’s celebration of life will be Monday, April 8, 2019 at 11:00 am at Sunrise Presbyterian Church located at 3809 6th Avenue South, Great Falls. Schnider Funeral Home is handling the arrangements. Memorials in her honor may be given to Sunrise Presbyterian Church or to Russell Park. If choosing Russell Park please make checks to Donald Bedker with Russell Park in the memo. Thank you! To plant a tree in memory of Gloria Fae Bedker, please visit our Tribute Store. "Email Address" would like to share the life celebration of Gloria Fae Bedker. Click on the "link" to go to share a favorite memory or leave a condolence message for the family.